New to Ten & Dynamic Reformer Pilates? Start here. 2. What's Dynamic Reformer Pilates? 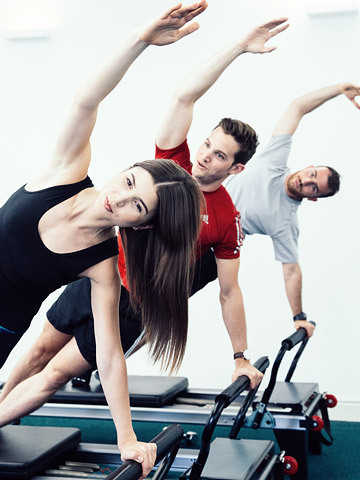 We're best known for our Dynamic Reformer Pilates classes, but we also offer Physiotherapy, Sports Massage, along with HiiT, Barre, TRX, Yoga and Stretch classes, Personal Training and exercise rehabilitation. Ten's trainers are amongst the best in London (we're 3-time winners of the Tatler Gym Awards). Our focus on posture, form and control makes our workouts as safe and sustainable as they are effective and time-efficient. Think of it as Pilates taken to the next level. So there's the same focus on form, control and on a strong and aligned core. And the same benefits for posture, flexibility, mobility and balance. But Dynamic Pilates goes a step further – it's an intense and dynamic full-body workout that combines classic Pilates moves with more functional exercises to increase the intensity of the overall movement and deliver greater conditioning and muscle toning benefits. Everything we do, we do our way. Using the knowledge and expertise we've gained from 10 years as one of London's leading Pilates Providers, our workouts are as safe and sustainable as they are immersive, intense, effective and time-efficient. In all our fitness classes, including HiiT, Cardio, TRX, Yoga and Barre, we place the great emphasis on quality of movement, technique, form and control, rather than just on effort and fatigue. And we offer the same small class sizes, expert instruction, individual attention and hands-on correction. – You're completely new to Reformer Pilates or to Ten. – You're currently training elsewhere and want to see how we're different before you swap. If you haven’t already created your account with us, register here (we’re pay-as-you-go, so there’s no membership or joining fee). Once that’s done, you can buy and book your classes however you like – over the phone, in Studio or online. Ten is unusual - if not unique - in London in having a dedicated team of expert in-house Physiotherapists and Massage therapists working alongside our class Instructors and Personal trainers. By focusing on addressing the cause of injury or dysfunction rather than simply easing the symptoms, their goal is to help you move better. Whether that’s to do with injury treatment and rehabilitation, pain reduction, muscle tightness, joint mobility, postural alignment or performance enhancement, we’re here to help you return to natural, effective, functional movement and a healthy, happy, pain-free life. We are registered with all major Private Health Insurers. Our approach to client wellbeing is significantly different to anything else you’ll find in the fitness and wellbeing sector – in fact we believe it’s unique in the UK. We call it our Circle of Care. It’s a collaborative and integrated partnership between our Trainers and in-house Therapists. In contrast to the way the fitness industry typically operates, our Trainers and Physios work together to manage every stage of a client’s physical wellbeing – including exercise, prehab, injury management, treatment and rehab – enabling us to providing you with a seamless progression from one stage to another. In the fitness industry, there’s still way too much focus on the intensity and challenge of workouts rather than the quality of the movement within them. We’re different. Our MoveBetter approach is all about making our classes and workouts as safe and sustainable as possible – while still being hugely absorbing, effective and time efficient. – move more efficiently, so you can maximise the benefits of exercise. We ask you to arrive 15 minutes early for you first class. That’s so you we can make you welcome and show you where everything is, and we can talk about any niggles or injuries you may have. You’ll need to complete our exercise readiness form before attending your first class. It’s for your safety, and makes us aware of any injuries or health issues you may have so we can adapt your workout accordingly. You can do this in studio, or online. Do it now, and you’ll save time when you get to the Studio. Wear clothing that will allow you to sweat and move freely. If you’ve come for a Dynamic Reformer Pilates or a Reformer Pilates based class, you’ll need gripsocks (if you don’t have any, don’t worry - they’re available at Reception). You’ll need trainers for HiiT, TRX and Personal Training sessions. If you’ve come for a mat based / bodyweight class, or Barre we recommend bare feet or grip socks, except for our Yoga classes where you will be expected to practice with bare feet. We provide water and towels. We have 8 Studios throughout London. We’re in Mayfair, St James’s, Fitzrovia, Hatton Garden, the City, Notting Hill, Little Venice and Chiswick. We’re London’s leading Dynamic Reformer Pilates provider. We also offer a range of fitness classes (including HiiT, Barre, Yoga, TRX and Stretch) along with Personal Training, Physiotherapy and Sports Massage. There’s no joining fees. We offer pay as you go blocks or rolling contracts. So you’re free to come when you want to, not because you feel you have to. – How much is my first class? We offer an introductory block: 4 classes for £50. – How do I buy classes? First you’ll need to create an account with us. Register here. Once that’s done, you can buy your classes in whatever way suits you best - in Studio, over the phone, online or via our App. – How do I book a class? As long as there are classes on your account you can book your classes in whatever way works best for you – in Studio, over the phone, online or via our App. You can buy classes the same way. – How do I book a PT or Physio session or Massage? All sessions can be booked online. But if it’s your first time with us, we recommend booking by phone or in person so we can understand more about your needs, and how best to meet them. – Is there a late-cancel policy? Like all class-based providers, we have a late cancel policy. If you can’t make your class, we ask for 12 hours notice. If you leave it later than that, you will be charged for the class. – How long does a block of classes last? Unless stated otherwise, all block of classes are valid for 6 months from date of purchase. – Is Physiotherapy covered by my health insurance? We are registered with all major Private Health Insurers. So as long as your insurer has agreed to your sessions with us, you’re covered.